A blog devoted to bringing viewers new music as well as up and coming bands that I believe deserve to be hard. Though it is mostly rock music, I like to toss it up every once in a while and add something a little special. Stop by, enjoy yourself and immerse yourself in the music. 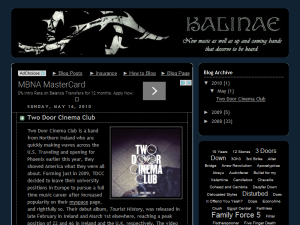 This what your Kalinae - New Rock Music Blog Ad will look like to visitors! Of course you will want to use keywords and ad targeting to get the most out of your ad campaign! So purchase an ad space today before there all gone! If you are the owner of Kalinae - New Rock Music, or someone who enjoys this blog why not upgrade it to a Featured Listing or Permanent Listing?